30 Aug Congratulations to Grant Acosta on a great article! Our very own Grant Acosta has been featured in Silicon Slopes! Congratulations, Grant! Read the story below. Most people, more or less, adhere to the same archetypal aspirations in their life: go to school, get a good job, have a family, and work hard until you are able to settle down and enjoy your life in retirement. It’s a linear yearning. One foot in front of the other, from one point to the next. Such is life, however, that this hardly ends up being the case. As it is, our stories are often rife with roadblocks, pitfalls, and shortcomings that obscure our vision on that sequential quest to happiness. And for some, the jagged line is perceived as failure and quickly siphons their motivation to achieve their dream they have worked for. And for others, it’s an existence in which to thrive. Years ago, high above the world in the Sierra Nevada mountain range, young southern California native Grant Acosta follows his father up a snowy ridge, eyes set on the jagged Mount Whitney looming in the distance. Although, having climbed to the peak with his dad 9 times before, he could probably find the way up on his own. Between conquering mountains, surfing the breaks off the coast of Orange County, and riding powder on his snowboard, it’s clear that Acosta’s father instilled in him a respect for nature and, perhaps more importantly, a drive to explore new things, be bold, and to deviate from the path. Fast forward to today. Acosta is now a Business Analyst at Utah-based Salesforce implementation partner Simplus, a position that he describes as his dream job. 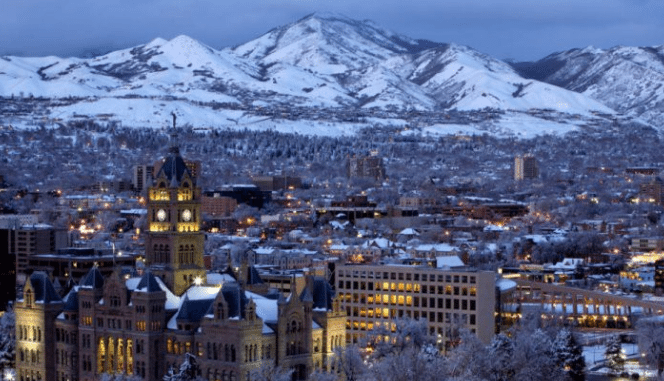 He loves the culture and camaraderie of the company, and Salt Lake City’s proximity to the mountains allows him to still get his routine dose of the outdoors. However content Acosta is with where his path has lead him, he will be the first to tell you it wasn’t a straightforward one. His story starts out fairly normal: after graduating high school, Acosta attended the University of La Verne for a year before deciding to enlist in the military where he served for four years. After his service in the military, Acosta returned home to Rancho Cucamonga in 2005, where he began to look for a job in his field. Due to workforce demand, he looked toward finance. Except there was only one thing wrong with the job. Once the economy started taking a dive, Acosta didn’t want to stick around to see his own demise. He changed his path and returned to school. While studying at Chaffey College and then the University of Redlands, he picked up a bartending gig to make some money on the side, a job that he did on and off while in the military. He finished his undergraduate in Business Administration with a minor in Graphic Information Systems in 2016. Acosta finished his undergraduate degree and made the decision to attend graduate school. He was accepted into a graduate program at the University of Utah, so he and his family packed up their home in Redlands, CA to make the big move to Salt Lake City. Only he wasn’t going to get his graduate in business administration or GIS — he would be studying Information Systems. He planned out his life so that he could support his family for a year without a job and got to work on his graduate degree. Throughout his studies, Acosta took every opportunity he could to attend information sessions and seminars in order to learn more and explore career options. It would be through these functions that Acosta would discover his current path. “A speaker from Simplus came to campus during one of these sessions to talk about the company,” Acosta said. “He was so passionate in the way he spoke about the company and its culture — something that was absolutely absent in my last career.” Acosta eagerly approached the speaker after his presentation. Two months later, Acosta gets an email. After a series of interviews, Acosta was offered a job as Business Analyst at Simplus, the first of its kind, in June 2017. Since then, he has taken an active role in developing the strategies and roles of that position. Many dirt paths and dead ends inhibited Acosta’s linear path to success. But through tenacity, open mindedness, and exploration, it seems like he has found his way back on the paved road. Back up in the high Sierras, teenage Acosta and his father stand at the base of Mt. Whitney, choosing their route to gain the peak of the mountain.